1. Bear Lake Road - Accessed off of Hwy 36 immediately after entering Rocky Mountain National Park (RMNP) through the Beaver Meadows Entrance, this drive affords breathtaking views and ample opportunities to view wildlife. Pass by a snow covered, glacial carved meadow, Moraine Park, to look for herds of elk and mule deer browsing willow and mountain grasses. Continuing along this road, sightseers will be affronted with a magnificent view of the continental divide. Often, these peaks will be shrouded in a "halo" of wind-whipped snow, showcasing the jagged lines of each mountain. Snowshoeing, cross-country and backcountry skiing are all winter sports that originate from trails along this road corridor, so for those seeking a drive with a bit more adventure, this is the place to be. 2. Trail Ridge Road to Many Park&apos;s Curve (via Beaver Meadows Entrance) - Although Trail Ridge Road is closed to through traffic during the winter months, the scenic overlook at Many Park&apos;s Curve is usually accessible and provides sweeping views from above Horseshoe Park, Upper Beaver Meadows and Moraine Park. After entering Rocky Mountain National Park via Hwy 36 and the Beaver Meadows Entrance, continue past Upper Beaver Meadows to potentially see elk, deer or coyotes along the side slopes. Stop for pictures of Long&apos;s Peak and the continental divide at the big rock pullout on the south side of the road before continuing past Deer Ridge Junction into the subalpine life-zone. Here, tall spruce and pine trees line the road and harbor wildlife such as bobcat and snowshoe hare. Continue past the Hidden Valley Picnic Area, equipped with a sledding hill, snow play area, and short trails for the more adventurous visitor. Many Park&apos;s Curve boasts a boardwalk with interpretive signs . A panoramic view awaits those who stop here to take in the scenery. This drive can be combined with the Fall River Road to the Alluvial Fan drive and done as a loop- in through the Beaver Meadows Entrance and out through the Fall River Entrance. 3. Fall River Road to the Alluvial Fan - From Estes Park guests will travel the bypass of Wonderview Avenue past the historic Stanley Hotel which then merges into Fall River Road. Between the junction of Wonderview/Fall River Road and the Fall River Entrance Station (North Entrance) to Rocky Mountain National Park, guests may see wildlife such as several large, resident bull elk, wild turkeys, and the occasional flock of bighorn sheep. This short stretch between town and the Park teem with wildlife opportunities and shouldn&apos;t be missed! Once guests have entered RMNP, they will travel past Cascade Cottages, the site of a large Great Horned Owl Nest, to Horseshoe Park. Here folks can expect to see wildlife such as elk, deer, coyotes, and magpies near Sheep Lakes, the summertime haunt of bighorn sheep. Once past the lakes a quick right onto Old Fall River Road will bring guests to the Alluvial Fan. This geologic wonder is the remnants of a past flood, caused by and earthen dam breach in the 1980&apos;s, which was re-engaged in the fall of 2013 by a second flood caused by steady rains. Large boulders, lifted and carried by strong currents, line the roads to form a "fan" or delta of debris. Throughout this area, signs of new life can be seen in the small trees poking through the rubble. This area is an excellent birding site as cavity nesters such as bluebirds, woodpeckers, wrens and small owls can often be found throughout the different seasons. A short walk to see a frozen waterfall, enhanced by the flood, can be accessed from the East Alluvial Fan parking lot. 4. Devil&apos;s Gulch to Dry Gulch Road - From Estes Park head north on MacGregor Avenue past the MacGregor Ranch to obtain great views of Lumpy Range and the Twin Owls rock formations. The high mountain meadows along the road harbor potential sightings of Elk, Deer, Coyote and the occasional bird of prey such as red-tailed hawks, golden eagles and peregrine falcons. 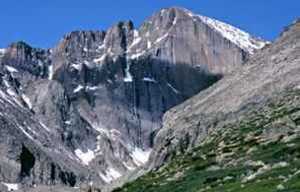 Great views of Long&apos;s Peak can be viewed as guests head south on Dry Gulch road, which ends at Hwy 34 by the Marina. Along this drainage, bobcat, bear and even an occasional mountain lion have been seen by the lucky, sharp-eyed sightseer. 5. Hwy 7 from Estes Park to Wild Basin - Drive south out of Estes Park past residential areas towards Lily Lake, which is a non-fee area of Rocky Mountain National Park (RMNP). 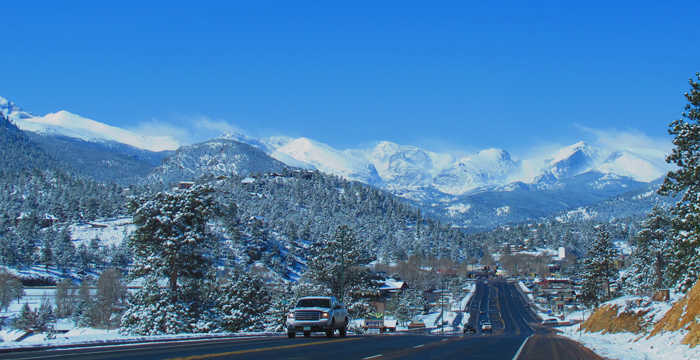 Stop for a stroll or continue past for several miles until the Long&apos;s Peak and Meeker Park pullout is visible on the west side of the road. 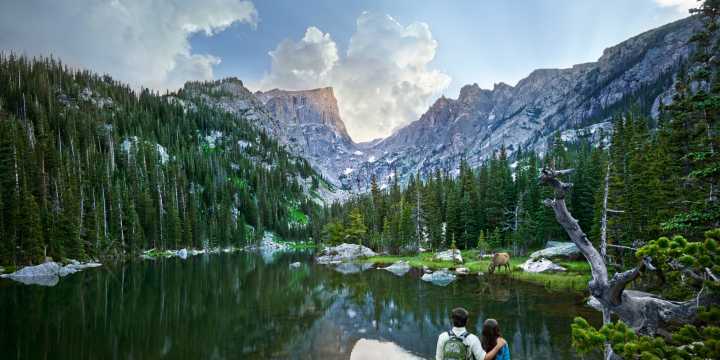 Here folks can take in amazing views and photograph the tallest peak in RMNP. Across the road is the site of the Enos Mills Cabin. Enos is credited with being the "Father of RMNP" as he worked tirelessly with congress to approve surrounding lands as a National Park in 1915. Further still, the trailhead to both Long&apos;s Peak and the Wild Basin area give way to great snowshoeing opportunities. Whether driving or hiking, this scenic drive won&apos;t disappoint. For those who would like to leave the driving to someone else, the Rocky Mountain Conservancy- Field Institute offers a Wintertime Wonders Bus Tour that takes participants along the Fall River Road, Many Parks Curve and Bear Lake routes recommended above. 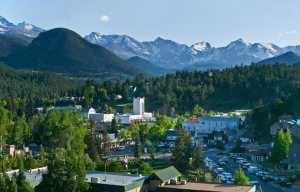 This leisurely 4 hour tour includes entrance into Rocky Mountain National Park and a skilled naturalist guide to discuss cultural and natural history while keeping an eye out for wildlife photo opportunities. For more information about this or other educational tours or classes offered by the Conservancy, please visit www.rmconservancy.org and click on the "Learn with Us" link.